Transparent batteries could lead to designs for "transparent" cell phones and other gadgets. Researchers have previously made transparent variations on other major classes of electronics, including transistors and the components used to control displays, but not yet batteries. "And if you can't make the battery transparent, you can't make the gadget transparent," says Cui (project lead, Stanford University). 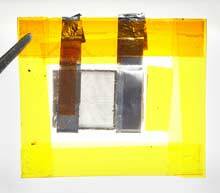 Some battery components are easier to make using transparent materials than others. The electrodes are the tricky part, says Cui. One way to make a transparent electrode is to make it very thin, on the order of about 100 nanometers thick. But a thin electrode typically can't store enough energy to be useful. So far, his lab's prototypes can store 20 watt-hours per liter, about as much energy as a nickel-cadmium battery, but Cui expects to improve this by an order of magnitude, in part by reducing the thickness of the polymer substrate, and by making the trenches that hold the electrode materials deeper.